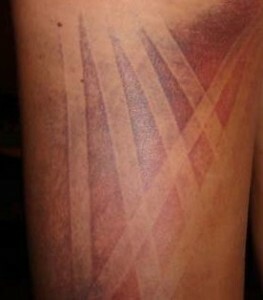 Athletic taping may be used for preventive or supportive taping and bracing. It can also be used to facilitate pain-free movement and function during various activity. Tape comes in a variety of colors, widths, tensile strengths, materials and shapes, depending on its purpose. 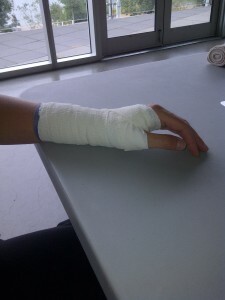 For this reason, taping can be applied safely on most parts of the body. Athletic tape assists and supports injured or weak areas of the body, so its materials, function and availability differ. 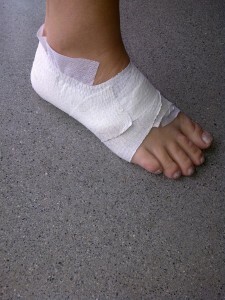 Kinesiotape is the latest in taping technology. 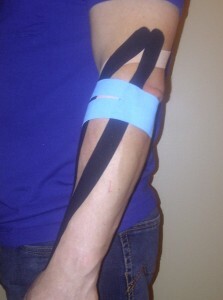 Unlike traditional taping, kinesiotape does not restrict motion… it is meant for movement! This is why it is so popular with athletes, and you will often see the bright-colored kinesiotape on athletes all around the globe. Kinesiotape can assist in pain relief, muscle activation, ligament support, and neural feedback. It is gentle and safe, which makes it an excellent tool for lymphatic drainage and for use during pregnancy! Kinesiotape is not just for athletes and may be used to treat whiplash, neck & back pain, joint injuries, tendinitis, swelling & bruising and many other common symptoms. It is sweat-proof, water-immersible, and lasts 3-5 days to enhance the benefits of your treatment even after you’ve left the clinic. Please feel free to contact Anita Wilson, RMT or Igor Kharif, PT at the clinic if you have questions about the various types of taping and how it may benefit you.